Sales and marketing organizations are seeing a rapid evolution of solutions for automating their core business processes. While we are years away from anything like an integrated ERP-class solution that can manage the full range of sales and marketing activities, the building blocks are available today. CRM vendors have established that a single system of record is within reach for the sales team, and an emerging group of companies are is starting to prove that this goal is attainable for the marketing side of the house as well. However, automating these two organizations will be a major undertaking for large companies. There will be significant process, cultural, and technical challenges. But the benefits are self-evident: lower cost, higher efficiency and productivity, greater accountability, better performance, improved customer experience, and potentially shorter sales cycles. The 80/20 Rule and the 50/50 Rule: IDC research shows that up to 80% of the content marketing generates is not used by Sales, even though a lot of it is specifically created for Sales and Channel enablement. Additionally, customers say that Sales reps are insufficiently prepared for their initial meeting 50% of the time. Clearly a massive disconnect is at work. 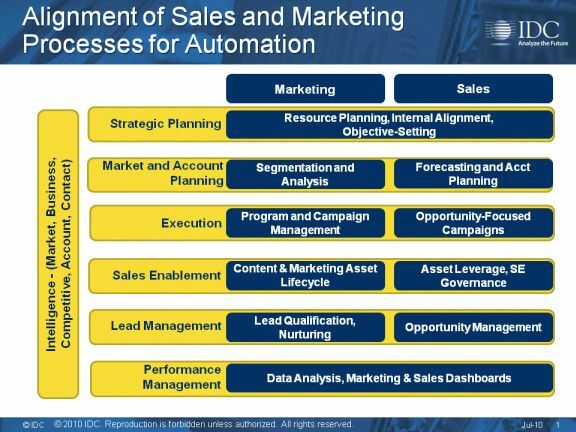 IDC's Framework for Sales and Marketing automation is, therefore, focused on the tight alignment of key Sales and Marketing processes. This framework represents only those processes that must be coordinated (potentially integrated) between the two organizations. It is not meant to be a comprehensive map of all the processes in which each organization must engage to be successful – there are many activities on each side of the dynamic that do not have a corollary on the other. Marketing operations and sales enablement teams are especially critical, they should have representatives from both organizations with senior level sponsorship. Marketing needs to be very cognizant of how leads and lead details will flow into the SFA/CRM environment. Sales needs to be diligent in making sure marketing is capturing the high priority prospects and the high priority details so that lead acceptance criteria is routinely fulfilled. 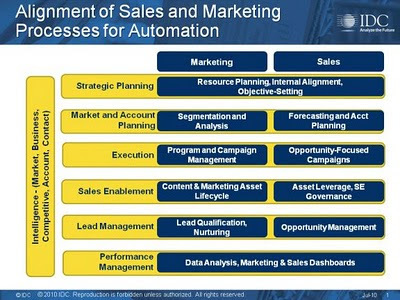 One of the key issues for automating sales and marketing is establishing a shared automation road map. Upcoming research from IDC will help you: prioritize your plans based on business impact and implement best practices to be most successful.